My new friend Harry and I had been splashing through half frozen puddles on a (suspiciously) small path through a hilltop bog, visualising our glorious podium finish after the 44 mile run through the Brecon Beacons. We were feeling strong and had opened up a big lead on the field with the group behind us out of sight. But as we crested the ridge, I realised that we were WAY off track. This wasn’t an orienteering race – it was fully signposted and for reasons known only to ourselves we had ignored the left turn and instead continued up the bog. I was now realising with horror that the race course was a long way down the hill, over a mini valley, and the direct route had no paths. We were so far off course, that I couldn’t even see the ant like runners in the distance, but Harry could so off we went, trying to stick together and trying to stay on our feet. Difficult when we kept falling into deep pools of water and streams hidden in the grassy tussocks everywhere. “Not until we are lost…” I began to understand two things about myself: firstly I am a total muppet, unable to follow simple directions, and secondly I love going off track and even though I’d just thrown away the only victory I may ever have in an ultra race, I was enjoying stumbling through the bog more than anything else so far that clear, frosty day. I was on a high after our misadventure, and we were only about three hours in, so I had plenty of time to catch the leaders. At the next checkpoint I found out that I was 32 minutes behind them. I ran as fast as I could (which in an ultra is a kind of slow shuffle) and closed the gap to about 20 minutes over the next hour or so. Then I went wrong again and ran way too high after the last big climb of the day. This was getting embarrassing. Undeterred until the final checkpoint with six miles to go, I finally threw in the towel when I went wrong for a final time, losing another ten minutes running up a dead end in the forest. It was really hard to motivate myself after that, and I suffered further embarrasment when I was asked “didn’t you already pass me?” by someone. Yes. I’ve passed you three times now!! It was brilliant to come back to the Might Contain Nuts, Brecon Winter Ultra. It was my first ultra last year, and still the biggest high of my life to go from Type One diagnosis to smashing my humble expectations of finishing, to come fourth (after giving up third place due to a navigational error). I can take a lot of positives from the run. First, despite not being able to do proper training for this event, I still felt stronger throughout. I was able to push for the last few miles, and I didn’t have such a low point in the middle of the race as I did last time. And this in spite of the fact that I extended my run by an hour due to terrible navigation. Second, my blood glucose control was very good – much better than the CCC. The chart below shows my control – my BG dipped to 3.8 at one point, but I felt fine and just popped a couple of jelly babies. I ate and average of 30g of carb an hour on Saturday to keep BG constant – much less than the 70g last year. I also drank a lot less water. Is my body somehow adapted to perform with fewer inputs? Who knows… but I felt full of energy all the way round. Would be interesting to know whether I would have felt even better with more food. Blood glucose before, during and after running. The blue line represents when I was running, and also the target range for BG. Thirdly, ultras are just brilliant things to do. If you’re competitive like me and you run a 5k, all you want to do is destroy your competitors. Feelings couldn’t be more different on an ultra. I had a long conversation with a bloke running with his dog for the first few miles, and then an even longer one with Harry while we were out in front. We talked about training, diet, diabetes, other races, where we had lived, travelled etc. Even though in theory I was racing against him, I wanted nothing more than for him to do well in the race. I genuinely didn’t care whether he beat me or not. Fourth, the people I was with all had a brilliant time. Four out of five of us ran further than we’d ever run before. For me it was the second furthest. 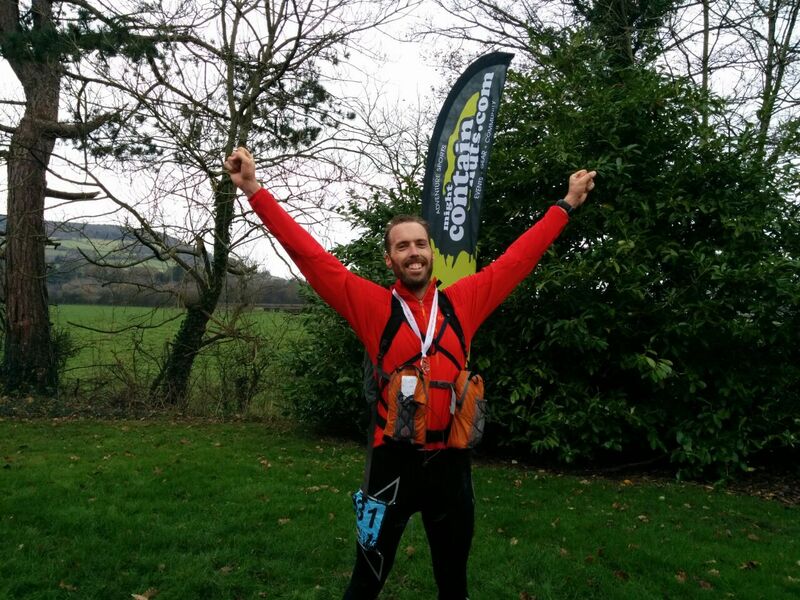 Henry somehow managed to complete 29 miles in six hours having fun for a sum total of 30 minutes in the previous three months – incredible! 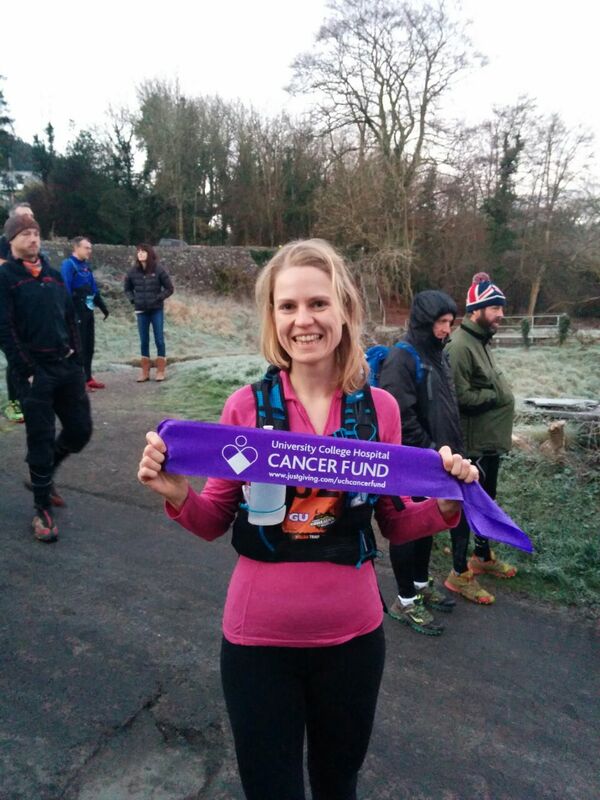 Emily raised about £1000 for University College Hospital Cancer Fund – a really good cause which provides support, services and equipment for cancer patients and their families which the NHS can’t afford. Emily had never liked running until a couple of years ago, and I was so proud of her for smashing the ten mile race! Emma picked up speed steadily round the 29 mile course, and Mark ran the ultra damn fast with what must have been the heaviest bag in the field. There were lots of smiles that evening. Fifth – I still came fifth or sixth (results aren’t out yet). Not bad considering I ran an hour more than everyone else! Harry came in in 11th, looking pretty happy too. I’d have preferred us to be first and second though! I can’t navigate or even follow simple directions. I need to get better at that if I am ever fortunate enough to find myself at the front of the field again. My aim for 2015 is to try to get as close to the top British runners as possible. I have no idea how realistic that is, but I may as well aim high! It’s really tempting fate, but I feel that for the purposes of running at least, I have now “mastered diabetes”. It is something I have to think about every day and constantly when I’m running. But I kind of know how it works. It’s not a disadvantage. As well as doing lots of running, I’m now doing yoga as much as I can (two to five times a week) which I’m really enjoying. It should be good for my flexibility, body awareness, strength, alignment, prevent injuries and (most importantly) kick start my day with a feeling of zen, calmness and energy!! I’m also doing strength training for running. It’s really really boring, but should also help with injury prevention, improve endurance and increase running efficiency. I’m working with a coach and so will develop a periodised training plan over the winter mixing endurance and speed work. It will be interesting to see if I can manage all that whilst holding down a full time job! 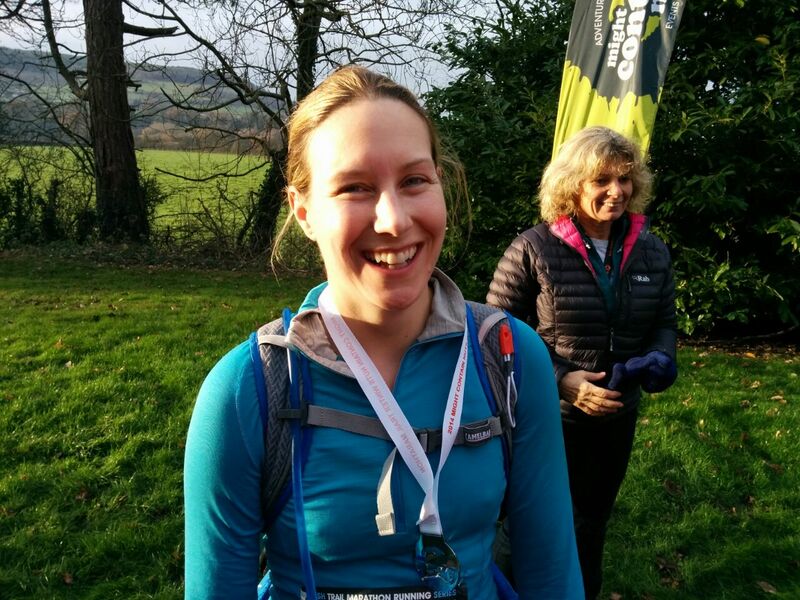 Then next year I want to run a small handful of races – the more mountainous the better. I’m already in the Vegan Welsh 3000’s in June which is run around all the 3000 foot mountains in Snowdonia and is very technical. They also require competitors to be vegan for the day, which will mean I need a new “medicine” to replace my trusty jelly babies. Not sure what else I’m going to do yet, but hopefully the Tromso ultra in July which is part running part scrambling, and maybe one of the Chamonix ultras in August. But it’s not all about racing and events. The best bit is just heading into the mountains feeling fit, strong and free. No race bibs, no watch. Just one foot moving in front of the other, feeling alive. Did she try hard enough? Emma had enough energy for a massive smile after running 29 miles. Who needs to train? 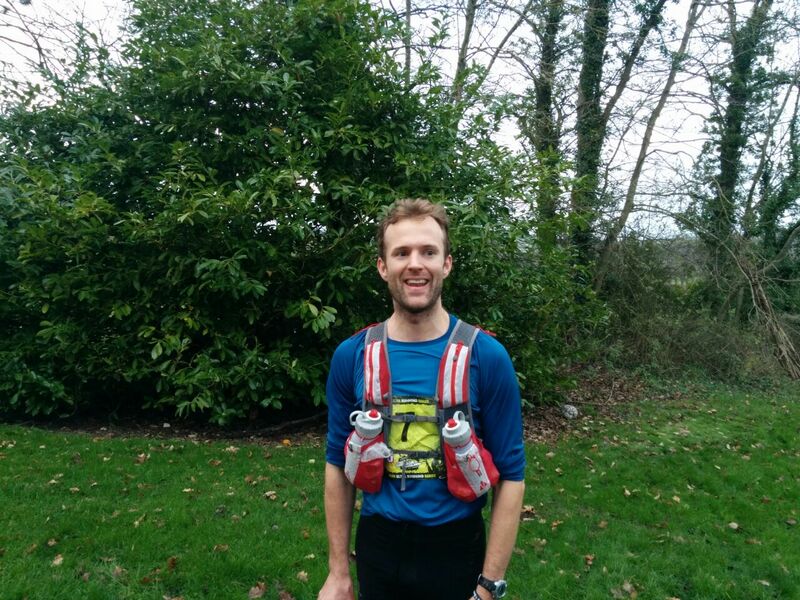 Henry is seriously considering the Marathon des Sables for 2016. His training plan involves at least twice as much running as the 30 minutes he did for this. I managed to smile despite getting to the finish line an hour late! ← Does training help the body burn fuel more efficiently? Zone out for a second too long, and you’ll find yourself massively off track. I was at the Dorset CTS this weekend, plodding along, minding my own business, and I looked up to find myself surrounded by cows, in the middle of a bog, next to a locked gate. Turned around, the guy who was a couple of hundred metres behind me was whistling at me, waving his arms, pointing to the other end of the field. Path had taken a dogleg turn whilst I was busy singing to myself. Whoops! Fantastic effort and great, entertaining blog post. 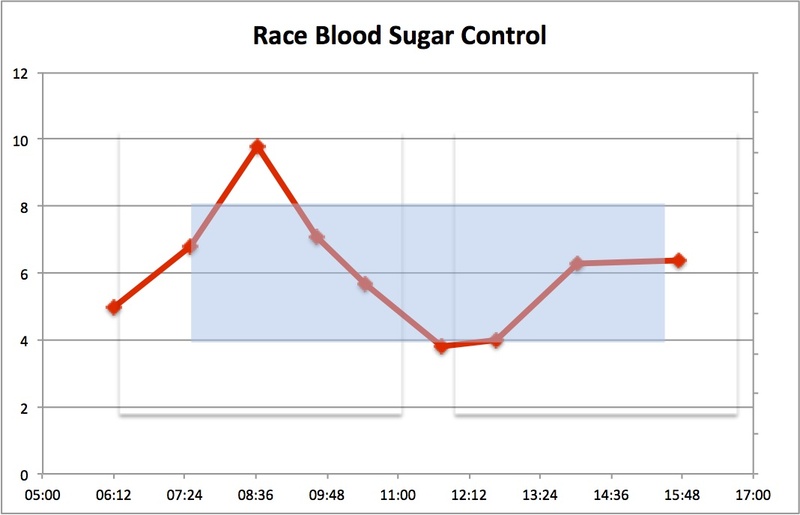 Do you have a strategy for in-race blood testing (e.g. every x minutes); your BG chart suggests there is one. What BG meter do you use and do you find it possible to test while running or do you just pull over and take a test, stationary? Well done again and good luck with chasing the top British runners.